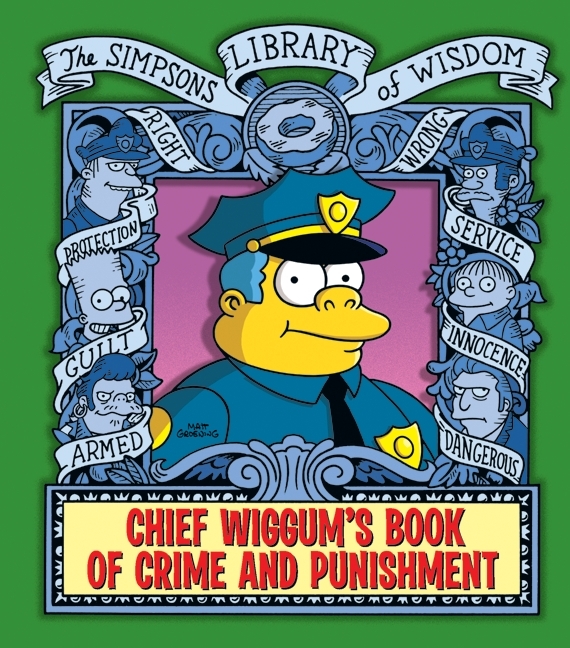 Chief Wiggum's Book of Crime and Punishment is was released in hardback, as part of the ongoing series: The Simpsons Library of Wisdom. Chief Clancy Wiggum might very well be the dimmest and most incompetent civic leader in Springfield, but as long as he has a gun and badge, most citizens exercise their right to remain silent. After many a late-night stakeout and thousands of early morning donuts, this top cop offers up his procedural wisdom on what it takes to wear the shield, how to keep on the right side of the law, and the real cost of quick and speedy justice. On Wiggum's watch you'll check out the seized property auction catalog, learn the secret language of police codes, find out how to avoid a speeding ticket, line up with Springfield's usual suspects, and get the skinny on Springfield's most wanted criminal...El Barto. Chief Wiggum's Year One Scrapbox! SPD Auctions - "Good Buys From Bad Guys!" The Springfield Police Department's Evidence Locker! Jail vs. School - Which is Worse? Hi-dilly-ho, Neighborinos! I Saw What You Diddily-did! The SPD's Little-Known Police Codes! The Springfield Police Department Pancake Breakfast! Wiggum P.I. - "The Big Queesy"
Badges! I Need My Stinkin' Badges! Modified on October 2, 2015, at 07:38.